You'll receive this quest at the conclusion of the quest The Old Watcher. The first thing you'll need to do for this quest is head back up to the Great Hall in Caed Nua and talk to the steward there. She'll tell you that the keep now regards you as its master, and that you'll be allowed to restore it to its former glory. Most of the restoration projects have iffy value, but rebuilding the Eastern Barbican is required. Without it, you won't be able to travel east from Caed Nua to reach Defiance Bay. Luckily, the steward will tell you that the resources necessary for the barbican have already been collected, so it won't cost you any time or money to construct it. The steward will also tell you that the "queen" you learned about in the previous quest probably refers to the goddess Woedica, who has a temple in the First Fires district of Defiance Bay. That means Defiance Bay should be your next stop. If you exhaust all of your conversation options with the steward, then she'll also tell you some of the history of Caed Nua and the Endless Paths beneath it. This will trigger the quest The Master Below and unlock the way to the Endless Paths of Od Nua, Level 2. When you reach First Fires, you'll find Woedica's temple on the southern side of the map, but it will be in ruins. However, you'll spot a ghost there, and it will reveal that the main part of the temple is located underground, and that it still survives. 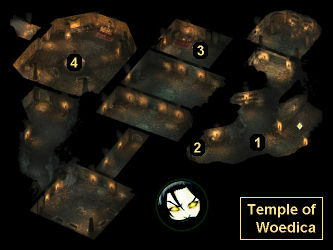 To reach the underground portion of the temple, you'll have to explore the Copperlane Catacombs and use the exit in the southwestern corner. When you enter the Temple of Woedica, you'll have a vision of the robed man you saw at Cilant Lis (#1). You'll be able to have a conversation with him, but you'll just be re-enacting a scene from your path, so all it will do is define a few things about one of your former lives. Just to the west of the vision you'll run into a guard named Hafmacg (#2). He'll demand to know what you're doing in the temple. You can appease him by bribing him with 350 cp, passing an Intellect 13 or a Resolve 13 check, or having your main character equipped with the Woedica Hood found in the Copperlane Catacombs. If you don't appease Hafmacg, then all of the mercenaries and cultists in the temple will turn hostile. You can try to infiltrate the temple. Once past Hafmacg, you should head to a northern room where you'll meet an initiate (#3). If you ask him what he's doing, then he'll tell you that he's practicing passphrases, which will allow you to let him practice on you. The initiate will then tell you the five phrases. Then at the door to the ritual chamber (#4), a dialogue will come up. If you're not wearing the Woedica Hood, and if it's in your stash or in the inventory of your main character, then you'll get an option to put it on -- even if you're playing a godlike character. You'll also have to choose whether you want to go in alone or bring your entire party. You should go in alone. If you don't wear the hood or if you take your entire party into the chamber, then the cultists in there will turn hostile and attack you. Inside the chamber, a shrouded woman will approach you and ask you for the passphrases. If you talked to the acolyte, then the right answer will always be the first answer. Then the woman will ask you about your "exploits." Your answers here won't make any difference. Finally, the woman will show you three visions, which will trigger your next three main quests: The Man Who Waits, Through Death's Gate, and Undying Heritage. You can just attack everybody. The battles shouldn't be too tough, and the enemies will drop a few "fine" items, plus a Lead Key (which doesn't appear to unlock anything). After completing the battle in the ritual chamber (#4), you'll interact with the soul of a shrouded woman, and you'll see three visions. These visions will trigger your next three main quests: The Man Who Waits, Through Death's Gate, and Undying Heritage.